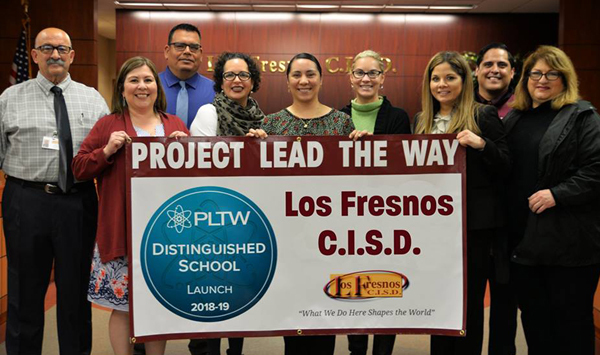 All nine Los Fresnos CISD elementary schools have received the 2018-19 Project Lead the Way Distinguished School designation for the Project Launch program. Only 214 elementary schools across the U.S. received the honor. Out of only 14 Texas elementary schools selected for the award, nine were Los Fresnos CISD schools. Two of the other schools were from Fort Worth while there was one each from Austin, El Paso and Temple. Administrators at the nine elementary schools were presented with their school banners at the Board of Trustees meeting Monday. The banners will be placed at each elementary school. The PLTW Distinguished School recognition honors schools committed to increasing student access, engagement and achievement in their PLTW programs. To be eligible for the designation, the schools had to offer at least two PLTW Launch modules at each grade level and have more than 75 percent of the student body participate during the 2017-18 school year. Los Fresnos CISD implemented Project the Lead the Way in the 2016-17 academic year for all grade levels. The elementary launch begin with one grade level that year, and increased to two modules per grade level in 2017-18. Between three and four modules per grade level were offered in 2018-19. “This recognition is a validation of the efforts of our staff who are committed to continuous improvement,” Salazar said. All elementary students in K through 5 participate in Launch modules and are taught by classroom and coding lab teachers as part of the district curriculum. Learning modules are approximately 10 hours of instruction in integrated STEM where students have to solve a real-world problem.